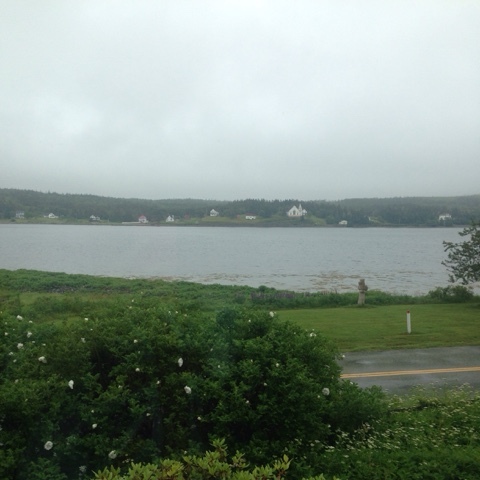 As I write this, I sit before a large picture window looking out upon a narrow harbor in Eastern Nova Scotia. Across the water, on the eastern shore of the harbor, quaint, whitewashed 1 ½ and two-story Victorian style homes and cottages rest nearly equidistant apart with a larger church building of similar design dominating one slope. In the middle of the harbor, a large otter periodically makes his presence known by bobbing his head above water between dives. In the foreground, seagulls and loons forage along the seaweed-strewn rocks of the near shore for some crustacean or fishy morsel. This is the first morning since our arrival three nights ago that the sun’s light pours forth unhindered by fog or cloud (in the time it has taken to write this the sky now has big puffy cumulus clouds whereas at the start it was clear blue). 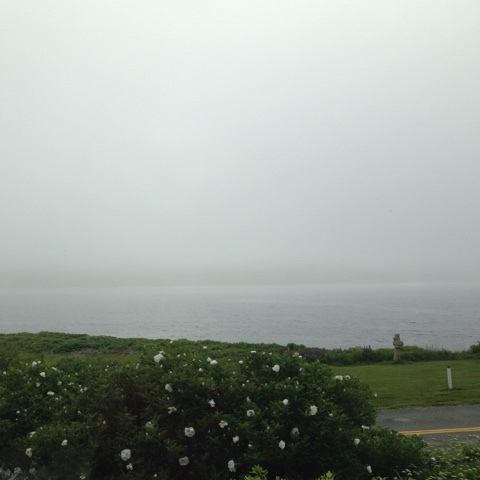 The last two mornings have been damp and cool with fog periodically obstructing the view of the opposing shore. While this morning seems glorious, the last two mornings have had a beauty and glory of their own. At times the sun would break through the clouds above to illuminate the fog giving off a lovely diffuse light that any photographer professional and amateur can appreciate. A cool sea breeze may allow the fog to lift or bring in yet another fog bank lower and denser than the last. The drizzle and fog of the last two days only accentuates the magnificence of a bright, sunny day like today. The view from the front picture window has varied day by day, moment by moment - entertainment enough for me. Speaking of entertainment, we are renting a home for the month that does not have a TV of any kind. There is internet, but that has been sketchy. Last night my 7 and 9 year old watched a pre-recorded show that was already downloaded onto my spouses computer. Today they watched a Minecraft video on Youtube as this is the first day the internet connection has allowed such a frivolous activity on top of what daddy needs to get work done. 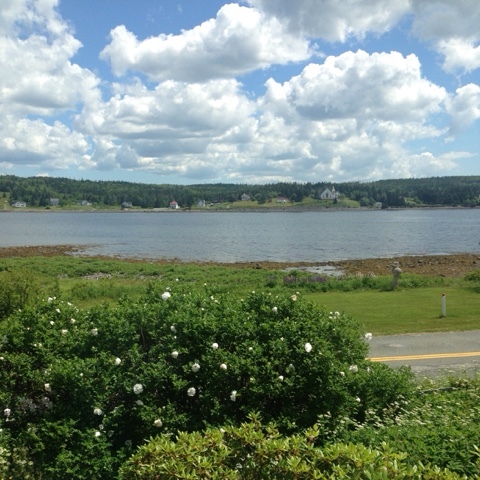 We are in a fairly remote location on the Atlantic side of southeastern Nova Scotia on a narrow ocean inlet called Issaac’s Harbour. We arrived late Tuesday night about 11:30 (an hour later than our home time zone). Once we turned off the main highway in New Glasgow, we journeyed an hour and a half over extremely rough roads to get here. We passed only 3 vehicles for that entire 66 mile stretch. The wildlife were apparently habituated to sparse night time travel as they wouldn’t even look our way until we were right on them – ordinarily we would rely on the reflection of their eyes to warn us of their presence. Thus, it was a tense hour and forty minutes attempting to avoid rough patches in the pavement and wilderness critters. We had stopped in Saint John, New Brunsick at a Walmart for a SIM card and a few non-refrigerated essentials. It was a good thing as there is precious little nearby our accommodations. The next evening we drove an hour to Antigonish for dinner and grocery shopping at Sobeys. On the way, we realized we had forgotten the cooler and insulated bags. So in addition to groceries we bought a couple of Styrofoam coolers in which to transport the refrigerated items. Shopping took a bit longer than usual, as the items on the shelves are in many cases different than what we are accustomed. Some of our staple items seem to be nonexistent – like a large package of Oscar Meyer Deli Meat and feta cheese. Though upon further reflection we may have been looking in the wrong spot for that last item. As a result, we were late getting to bed again the second night. Another challenge has been internet connectivity. The owners assured us that the connection in the house where we are staying is high speed and that they also have an internet dependent job when they stay. However, it wasn’t working as expected the last two days appearing to be sporadic at best. As of today the issue has been resolved. The SIM card purchased enroute was meant to act as a backup should there be any connectivity issues, but it turns out that the Walmart tech agents were incorrect in their assumptions about service area coverage. So we do not have connectivity backup as hoped nor do we have phone service for a 50-mile radius outside of the house. We hope to rectify this in the coming days, but that will also require an hour drive. Yesterday, around dinnertime, the electricity went out for about two hours. Luckily, I had already started a pot of chili and had it simmering for a while on the electric stove. After about 30 minutes of no power, we decided to take a drive around the harbor. We had a nice drive and got to see the house in which we are staying from the opposite shore. We espied a few parks and fishing spots. Along our way, the gentleman at the end of our road and whose number we have on hand should we need assistance, waved us down, introduced himself, and mentioned that the electricity was out all along the road. This was somewhat of a relief as we were not entirely sure it wasn’t an issue at the house. He also indicated that it is a rather common occurrence especially in the winter. Needless to say, I was rather stunned to hear that and it’s made me wonder how tolerable a winter in these same accommodations would be. Fortunately, I don’t have to find out. Needless to say, this newfound seclusion is an adjustment for our family. Nevertheless, I welcome the remoteness and the change of pace. For me this view, daily walks along the shore, and the restive nature of this place is well worth the hiccups. That being said we’ll see how we all feel after a month of this out-of-the-way lifestyle.